March 5, 2009: I attend my first NVC course, a three hour course titled, "Speaking Peace," by NVC Certified trainers Jori and Jim Manske. March 6,2009: I attend a four hour course titled, "Difficult Conversations: Connecting with Compassion," by NVC Certified trainers Jori and Jim Manske. March 6, 2009: I attend a three hour course titled, "Connecting with Compassion: A Relationship Workshop," by NVC Certified trainers Jori and Jim Manske. March 7, 2009: I attend an eight hour course Titled "Leading from the Heart: Creating the World You Want to Live In!" by NVC Certified trainers Jori and Jim Manske. March 8, 2009: I attend a four hour course (the second part of the Saturday course) titled, "Leading from the Heart: Creating the World You Want to Live In!" by NVC Certified trainers Jori and Jim Manske. March 22, 2009: This was the second time I listened to the audio Nonviolent Communication, by Marshall Rosenberg. June 10, 2009: I re-read Parenting from Your Heart, by Inbal Kashtan. 2005. Puddle Dancer Press. Paperback. 45 pages. Rec'd 11/5/08; first reading 11/15/08 (A); second reading 6/10/09 (A). July 29, 2009: I post my web page on "My Adventures With NVC. July 29, 2009: The first practice session at 702 Mosby Circle in the Heights is held. October 8, 2009: I attend a three hour course called, "The Language Going "Round the World," by NVC Certified trainers Jori and Jim Manske. October 9, 2009: I attend a three hour course called, "Creating the World You Want to Live In" by NVC Certified trainers Jori and Jim Manske. October 10, 2009: I attend a 7-1/2 hour course called, "Bringing Peace to Your Family," by NVC Certified trainers Jori and Jim Manske. October 11, 2009: I attend a 3-1/2 hour course called, "Deepening Your Spirituality," by NVC Certified trainers Jori and Jim Manske. January 20, 2011: I attend a three hour course called "Introduction to NVC," by NVC Certified trainer Kathleen Macferran. January 21, 2011: I attend a three and one half hour course called "Being Compassionate with Yourself," by NVC Certified trainer Kathleen Macferran. Janaury 21, 2011: I attend a three hour course titled "Life-Enriching Relationships," by NVC Certified trainer Kathleen Macferran. January 22, 2011: I attend three hours of a seven hour course entitled "Connection, Connection, Connection," by NVC Certified trainer Kathleen Macferran. January 23, 2011: I attend a four hour course entitled "Creating Safer Communities," by NVC Certified trainer Kathleen Macferran. May 5, 2011: I listen to audio tape Speaking Peace, by Marshall Rosenberg. April 30, 2011: I attend a three hour course entitled "Compassionate Families," by NVC Facilitator J. Lynn McDonald. September 6, 2011: I listen to audio tape Speaking Peace, by Marshall Rosenberg. September 15, 2011: I attend a two hour course entitled "Introduction to NVC," by NVC Certified trainer Raj Gill. September 16, 2011: I attend a seven hour course by NVC Certified trainer Raj Gill. September 17, 2011: I attend a seven hour course by NVC Certified trainer Raj Gill. May 12, 2012: I re-read Nonviolent Communication: A Language of Life, by Marshall B. Rosenberg. (A++). September 17, 2012: This was the third time I listened to the audio Nonviolent Communication, by Marshall Rosenberg. October 4, 2012: Listened to the CD Giraffe Fuel forLife, by Marshall B. Rosenberg. April 19, 2013: I attend an all day seminar by NVC Certified trainers Jim and JoriManske. April 20, 2013: I attend an all day seminar by NVC Certified trainers Jim and JoriManske. April 21, 2013: I attend an all day seminar by NVC Certified trainers Jim and JoriManske. February 2, 2014: I read The Steps of Nonviolence, by Michael Nagler. 1999. Walton Printing Paperback. 36 pages. Purchased 4/12/13. May 31, 2014: I read Nonviolent Communication Companion Workbook: A Practical Guide for Individual, Group, or Classroom Study, by Lucy Lew. 2003. PuddleDancer Press. Paperback. 210 pages. (A+). May 28, 2014: Listened to Disc One of the CD The Nonviolent Communication Training Course, by Marshall Rosenberg. May 29, 2014: Listened to Disc Two of the CD The Nonviolent Communication Training Course, by Marshall Rosenberg. May 30, 2014: Listened to Disc Three of the CD The Nonviolent Communication Training Course, by Marshall Rosenberg. June 2, 2014: Listened to Disc Four of the CD The Nonviolent Communication Training Course, by Marshall Rosenberg. June 3, 2014: Listened to Disc Five of the CD The Nonviolent Communication Training Course, by Marshall Rosenberg. June 3, 2014: Listened to Disc Six of the CD The Nonviolent Communication Training Course, by Marshall Rosenberg. 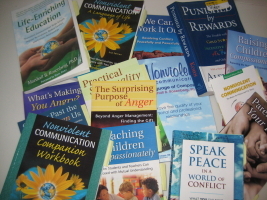 June 5 2014: Listened to Disc Seven of the CD The Nonviolent Communication Training Course, by Marshall Rosenberg. June 6, 2014: Listened to Disc Eight of the CD The Nonviolent Communication Training Course, by Marshall Rosenberg. June 6, 2014: Listened to Disc Nine of the CD The Nonviolent Communication Training Course, by Marshall Rosenberg. June 7, 2014: I give my first public talk on NVC, Tips in Setting Up a Practice Group, at Houston's first local NVC Conference.